Commemoration of The Confederate States of America, in all its modern and historical incarnations, is under attack. The rebellion's association with slavery has led some to question why we honor anything at all Confederate. Those with ancestral (or otherwise supportive) connections to the Confederacy - have found themselves on the defensive - citing a "heritage" that is worthy of celebration. They claim that their Confederate soldier ancestors fought with honor, in many cases died with honor, and in all cases deserve respect. They maintain that their Confederate kin were not a bloodthirsty pack of slave-mongering ideologues, so why should we treat them as such? Much of this has fallen on deaf ears. I wonder... can we divorce our Confederate ancestors - the common soldiers - from a national cause explicitly and undeniably linked to racial oppression and the preservation of slavery? Considering my recent attacks on Confederate heritage ambiguity, my answer might surprise you. Perhaps we can. But certain acknowledgements must apply. Let's examine my own Confederate ancestor as an example. I know of many on both sides of my family who shouldered muskets for the Confederate cause. I am most familiar with one Andrew Jackson Holbert, my maternal great great great great grandfather. Holbert was a yeoman farmer from Lawrence County, Alabama. He enlisted in the 16th Alabama Infantry when it formed in August, 1861. Holbert saw service in Kentucky and Tennessee and was wounded in action at Shiloh early in the battle on the morning of April 6, 1862. Family lore suggests he suffered a chest wound, stuck a purple (purple!! A taste for flashy accessories must run in the family) handkerchief in the bullet hole, then walked home to northern Alabama to recuperate. Once recovered, he reenlisted and fought out the remainder of the war as a private in the 27th Alabama Infantry. 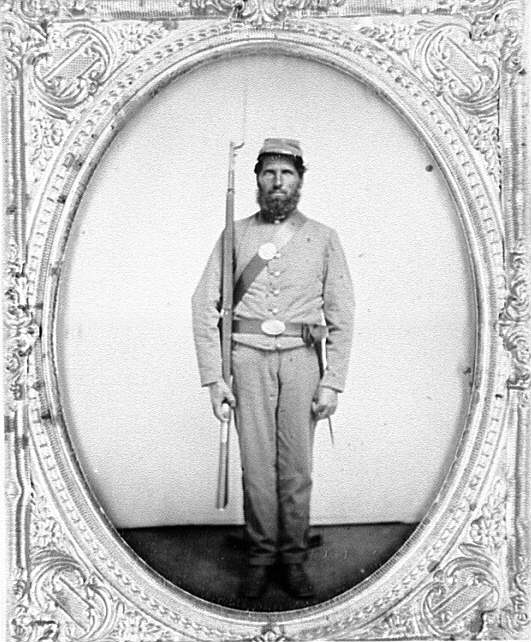 I am not sure when he rejoined the army but I know he was present at the Greensboro, North Carolina surrender in April 1865. And that's all I know. I have no idea why he joined the army or why he fought. No record exists (of which I am aware) that mentions his opinion on any motivational matter at all. I also know that northern Alabama was hotly divided on the secession issue and that while slaves were present in Lawrence County, they were certainly not ubiquitous . Finally, I know that he was literate. He could have joined the army for any number of reasons, and in fact, he might have been conscripted into the 27th, perhaps having seen too much of war at Shiloh to justify volunteering for further service. So the truth - I do not know Holbert's thoughts on slavery, secession or defending any cause. Being literate, he most certainly read about and was aware of the bitterly contested issues of the day, but that does not really tell us much. He could have enlisted because members of his family encouraged him to do so, he could have been swept up in a martial spirit and joined his community, he could have been upset about an invasion of his sister states and the probable invasion of his own, he might have wanted to embark on a great adventure, he might have thought that he was defending his rights (in the abstract, I suppose) against Federal tyranny. The list of reasons goes on and on and on (and on). Holbert fought and risked his life for some cause he must have deemed important, and (again in the abstract sense) this is a virtuous deed. One might commemorate that virtue...free from association with the Cause (with a capital C). But only because we cannot be sure what his motivations for fighting really were. Innocent until proven guilty, right...? Though it is clear that he stood up to be counted when no one was confused about the issues of war, suspicion of motivation alone is not a hanging offense. The motivational forces that compelled Holbert into the army could have been one or more of the above listed themes. These themes recur with enough frequency in the writings of Confederate soldiers to merit attention. And fighting with the explicit intention of preserving slavery might not have been one of them, though I would not be surprised to learn that he was perfectly comfortable with the institution. This I believe was typical of those who served in the Confederate ranks. Generally speaking, we don't know exactly why most individual soldiers served - we can only examine motivational forces thematically. Of course there are exceptions to this - some were quite specific. But nearly a million men served in gray. How could we possibly claim to know and illustrate with tangible evidence precisely why each individual fought? And as such, we cannot point accusatory fingers at every individual. My contention with the heritage crowd is not so much with their specific ancestor(s), but with their failure to acknowledge the ideological underpinnings of that miscarried national experiment known to history as the Confederate States of America. My issue with their steadfast devotion to Confederate symbols, indelibly associated with the Confederate nation, are not so much about linking individual common soldiers to any specific cause, but with the symbols' association with a national ideology wedded to slavery. Confederates might have exhibited great gallantry under fire (or not). They might have cared not a bit about slaves (or maybe they did). They might have fought to defend their firesides (or maybe they were just bored at home). In most cases we don't really know much at all. What we do irrefutably know is that eleven southern states seceded from the Union and waged a war for independence to preserve the institution of slavery. Anyone who drew a sword, squeezed a trigger, or pulled a lanyard for the Confederacy ultimately contributed to that aim. Without disunion and without war, there would have been no Confederate soldiers to fight and thus none to honor (or not honor, as it were). Why won't Confederate apologists acknowledge this? Why do they not include this rather salient feature in their narrow vision of southern "heritage?" Let's put the fundamentals on the table, sans all the Lost Cause mythology denying or dismissing the slavery issue, then we can talk about how to best honor our ancestors. When you claim "heritage not hate," well...you are missing the point.